UAE residents can rejoice as winter in the country is not officially over. Residents who bemoaned rising temperatures over the past couple of days can be relieved as temperatures are expected to dip again for the next few days, according to weather forecasters at the National Centre of Meteorology (NCM), Abu Dhabi. Temperatures across the country steadily climbed near or past 30 degrees since late last week. The mercury got as high as 36.5 degrees on Saturday. However, weather forecasters are holding warm winds coming in from the southern desert region responsible for this sudden peak in temperatures. "Once these winds have passed, the temperatures will dip to lows of 26 degrees and highs of 28 degrees across the country on February 19. We will continue to enjoy pleasant weather in the coming two to three days," assured Eisa Al Sereidi, a weather forecaster with NCM. The winds will pick up over the sea in the next two days, causing temperatures to dip in the evening and nights. Al Sereidi added, "Starting February 20, the temperatures decrease further for two days at highs of 25 degrees and lows of 16. Mountain regions, however, will be relatively colder." The maximum humidity would be 65 to 85 per cent across coastal areas, 55 to 75 per cent in interior regions and between 40 to 60 per cent in the mountains. Al Sereidi also stated that summer will officially begin in the country on June 23, and assured residents that they have a few more months to enjoy the good weather. 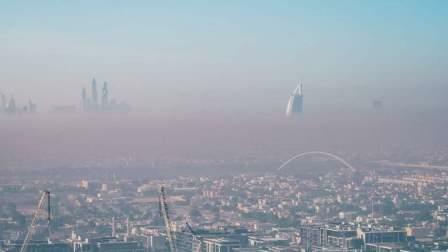 Khaleej Times spoke to a few residents who said that winter this year was a little extreme, especially with the few days in December that witnessed very dense fog. George Joseph, a resident of Abu Dhabi has to drive to Dubai to work every day. He said, "During the dense fog days, I chose to work from home because driving in the fog was too much of a risk. I've never seen anything like it." He added, "The weather has been really great, and I was a bit upset when temperatures rose, but it is good to know that it will get better again." Residents made use of the good weather by flocking at public places such as beaches, Al Qudra Lake, and camping at the Jebel Jais mountains. "We really enjoyed the winter this year as we went camping in the mountains very often," said Mohammed Usman, a resident of Sharjah.